2 Day Work Week, I love you! B and I arrived home last night after attending a Family Life marriage retreat in San Antonio, and we have great news: we have no plans on getting a divorce. Alas, we never did; still, I encourage any and all married couples to take a weekend out of the year to focus solely on their marriage. Regardless of how healthy or unhealthy you may consider the state of your marriage, a bit of attention and maintenance can profoundly alter its course for the better. If you're looking for a good place to start, visit http://www.familylife.com/. I'd like to thank B's arm for standing in to provide a more natural pose for my arm. I am more pleased than ever to have added additional details to my original bird tattoo. If you have a distinctly stylized idea and are super picky about details, which most ink enthusiasts are, it can be extremely difficult to commit to a tattoo expansion. Again, I urge you to find a reputable artist, whose work you are drawn to, because elements of your tattoo could get fouled up easily. For instance, Derek had to spend quite a bit of time slowly building up the outline for the frame. In doing so, he was able to create very fine, yet detailed, lines in the drawing. Less experienced or cautious artists may rush the process, which allows the ink to bleed, resulting in a smudgy, less sharp image. 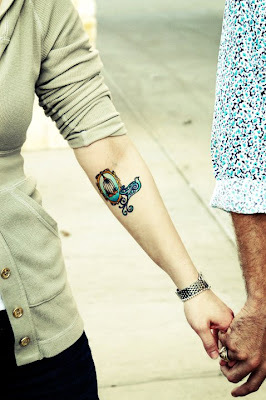 I did not want a lot of heavy black on my forearm, and his painstaking execution allowed for a delicate, clear image. Didn't Rachel do a great job with the photo? I've seen some of the other pics she took and can hardly wait to premier my new blog template!